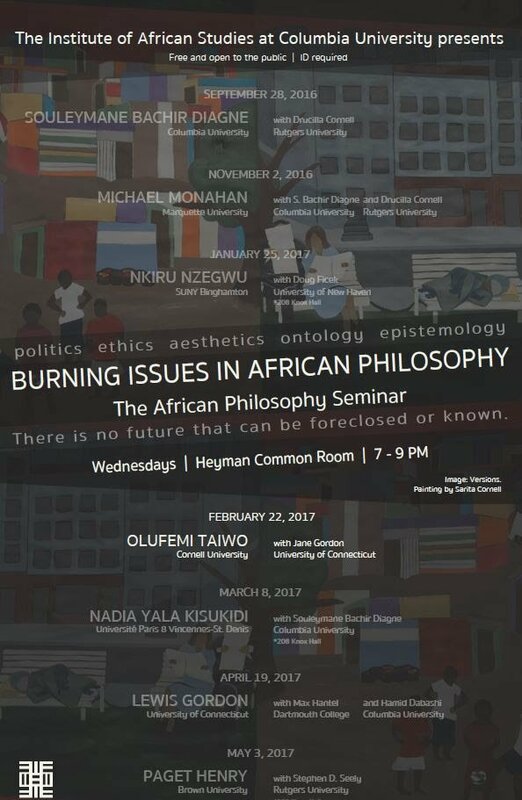 Burning Issues in African Philosophy is curated by Drucilla Cornell and Souleymane Bachir Diagne and presented by the Insitute of African Studies at Columbia University. It includes six seminars with Souleymane Bachir Diagne, Michael Monahan, Nkiru Nzegwu, Olufemi Taiwo, Nadia Yala Kisukidi, Lewis Gordon and Paget Henry. Speaker Abstract: As this speaker series is entitled Burning Issues in African Philosophy, I’ve decided to offer some reflections on philosophy from burning issues posed by African philosophy and its creolized hybrid—namely, Africana philosophy. Announcing a creolized element doesn’t reject the possibility of a prior creolized form, since, as these reflections will show, I do not presume an initial African “purity.” As the human being is the quintessential creature of metastability, the the solace of being onto itself, of being out of relations with all others, though often a wish, is a luxury or preemption that is not ours. Africa as our birthplace means the upsurge of self-consciousness was, as well, that of a reaching for which our species has its proverbial infinite task. There is poetic irony here, since a well-known prejudice is that consciousness in Africa was an import; that the continent’s name in one of its ancient tongues amounts to turning toward the opening of the birthplace (af-rui-ka, “turning toward the opening of the ka”). The peculiarly gendered, psychoanalytical significance of subsequent denying or at least forgetting humanity’s primordial womb speaks, proverbially, volumes. So, let’s turn to some erasure, forgetting, denial, and, as each fails under the weight of unsustainability, remembering. This series is made possible by financial support from the Provost Office and Arts & Sciences at Columbia University and the Partnership University Fund (PUF) of the French American Cultural Exchange (FACE). The venue for this series is provided by the Heyman Center for Humanities.